Dana J Photography new brand! After many long days designing and working on this project, Im happy to announce that Dana J Photography has a new look and brand! Im so excited to finally share this with you all, Ive been keeping it under wraps for quite some time! I was ready for an upgrade and step froward with my business. 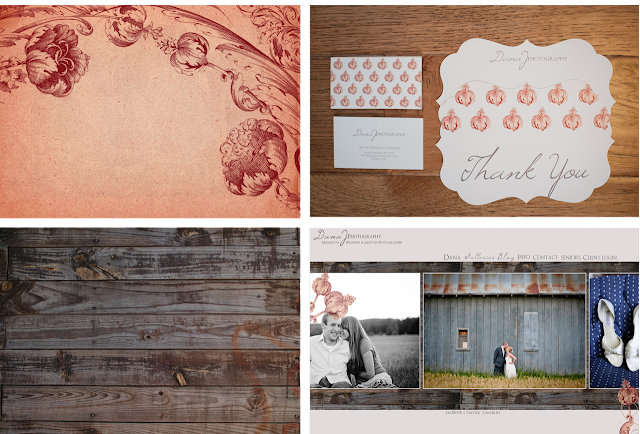 I wanted my brand to reflect a vintage romance, soft, inviting feel to it. I hope you like it! and be sure to become a follower of my blog below! Below are examples of where my inspiration came from and the right corner is the final product! Please check out www.danajphoto.com to see the full website in action! Please click the google plus one at the bottom to help my blog get off its feet and feel free to comment below!